The Land of Pauri Garhwal is blessed with splendid view of snow-bound peaks of Himalayas, scenic valleys & surround ings, meandering rivers, dense forests and hospitable people with a rich culture. Diverse in topography, the district of Pauri Garhwal varies from the foothills of the ‘Bhabar’ areas of Kotdwara to the soul-lifting meadows of Dhudatoli, sprawling at an altitude of 3,000 meters. Which remains snow-bound during the winter months. Filled with places of tourist interest, most locations in Pauri Garhwal offer a breathtaking view of the snow laden Himalayan Splendour. 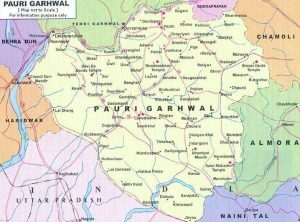 District Pauri Garhwal which is surrounded by the districts of Chamoli, Nanital, Bijnor, Haridwar, Dehradun, Rudraprayag and Tehri Garhwal,offers a panoramic view of the great Himalayas form it’s towns and villages. The majestic Himalaya and it’s mountain range can be seen from anywhere in the district.